Mercy Catholic College students come from all over the northern region of Sydney. In their primary years, they have attended a range of Catholic, State and Independent schools. The map below shows a typical enrolment address pattern. 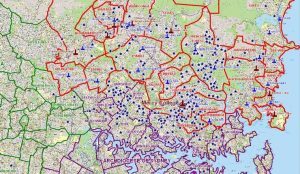 Each blue star represents a Mercy Catholic College student enrolment and visually shows how extensive the Mercy Catholic College catchment area is. Situated within the heart of Chatswood, Mercy Catholic College is within easy walking distance of bus and train transport. For full details on all bus and train services visit transportnsw.info. Use the trip planner, download timetables, maps and real time apps. Alternatively, call 131 500 to obtain up-to-date information on all transport services.